Daily deal service Groupon, hot off a new funding that valued the company at $1.35 billion, may not love all those clones of its service out there. But they’re certainly being realistic about things – tomorrow they’ll announce the acquisition of German startup Citydeal, CEO Andrew Mason just called to tell me. 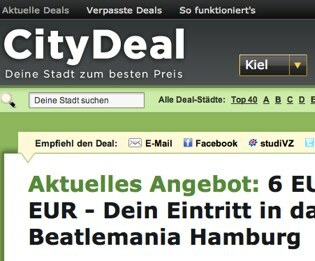 Citydeal first launched in January, raised €4 million in funding, and now has offers in 80 European cities. They have over a million subscribers to their daily deals, says Mason, compared to about 5 million for Groupon. Citydeal’s 600 employees will join Groupon’s 300 or so, and the combined company will now operate in 18 countries and 140 cities. The Citydeal services will be rebranded Groupon. Currently each city is under a different domain name and there are some variations on the name – see citydeal.de and mycitydeal.co.uk, for example. This is Groupon’s second acquisition. Earlier this month they acquired Mob.ly and opened a Silicon Valley office.